The liquid or paste raw material is spraied into minuty liquid drop by pressed spraier draw assistance from pressure of isoulate pump,and quickly drying through amplly heat exchange.(10~90sec.) at last ,the powder or samll granule is finished. It is applicable in foodstuff, pharmaceutical, chemical industry, dyestuff, ceramics, biochemicals, plastic and so on. The dry speed is fast and suitable for drying thermal sensitivity material particularly. The finished product is ball granule with uniform size.Its fluidity and solubility are good. The purity of product is high and its quality is good. It applied scope is wide.According to the characteristics of raw material,it can use hot air to dry and can also use cool air to granulate.It has strong adaptability to raw materials. Its operation is simple and stable and itws control is simple and convenient and is easy to realize automatic operation. electric heater KW 75 120 150 When the temperature is lower than 200, the parameters should be calculated according to the practical condition. Note: 1. The evaporated amount of moisture is concerned with the characteristics of material and evaporated temperature. It is calculated in the table by 150-160 of air in? 2. 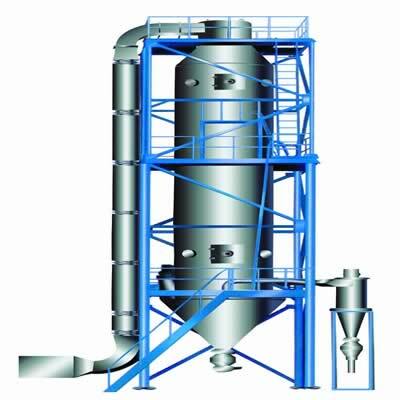 Customer may choose different drying ways such as downstream, countercurrent and mixing current, powder returning, etc in order to attend the needed effect of product. 3. The sketch of flow chart is schematic only. Customer should choose the subassembly in accordance with needs.